The 6.5 inch IPS LCD screen has 19.5: 9 screen and screen resolution, the FHD + screen has a pixel density of 396 pixels and the screen captures 91% of the handset's body. The Mobile processor is Kirin 710 octa-core processor is an excellent achieved about 130 thousand points in the antutu test, a good competitor to the processor Snapdragon 660 in the Mi A2 and proved efficiency of this processor is the same as in Nova 3i . It Supports GPU Turbo to increase performance efficiency with lower battery consumption. The phone is available in 128 GB with 6 GB Ram and a new 64GB with 4 GB Ram. As far as Camera concerned, It has Primary dual Camera 20 + 2 Mega Pixels F / 1.8 lens slot with similar specifications in the Mate 20 Lite phone and camera Supports isolation and 1080p video shooting with 60 frames per second with support for slow motion 480-frame video frames per second, Its control also supports cosmetic. It has front with a 16 mega pixel camera with f / 2.0 lens supports insulation, portrait and beauty. 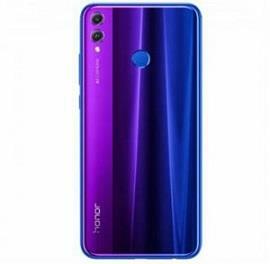 The operating system Mobile Honor 8x is an Android 8.1 interface with Huawei EMUI 8.2. The phone Supports the operation of two, third and fourth generation connections, and supports up to 400 memory card slots in a card slot. It's Weight 175 grams with glass design from the back and glass front with 2.5D layer on the screen, and 7.8 mm thickness. There is a 3.5mm headphone jack to install earphones and supports the radio. It supports alarm lights as well as notification icons beside the notch, and can be hidden from the phone settings. Supports virtual reality glasses and supports compass. The Honor 8x Mobile supports a fast fingerprint sensor on the back of the phone. The 3750 mA battery does not support fast charging 5V / 2A and 10W is shipped via a microUSB 2.0 port. The Honor 8X has Nano SIM card , dual sim. The Connectivity options include Accelerometer , Proximity sensor , light sensor , compass and fingerprint recognition. Phone Colors: Black - Blue - Red - Pink. There is no protective layer on the screen but the phone comes with a protective sticker on it. The phone does not support fast charging and the battery is charged in about two hours, excellent time and appreciate it as a blemished defect after little time. The rear camera does not support shooting 4k videos. The sound of the handset's external speaker is lower for the competitors. We noticed that there was a light shadow next to the notch but it was absolutely ineffective on screen performance. Excellent power-saving processor and excellent performance for the price. A giant screen with notch can be hidden from the settings. Although the size of the screen is larger, it is the same size as the usual phones because the screen is almost without edges. Very attractive and beautiful design with very respectable ores of honer. The cameras are excellent, and compete vigorously among middle class phones such as Samsung Note 6 and Oppo's F9. Strong battery lasts long but does not support fast charging. Supports the installation of a memory card + two slides at the same time. Honor 8X is a very cost-effective product. Made by honor, the manufacturing process is excellent to ensure the quality and service life. The design is simple and stylish, and the most attractive is the price of the value for money. In general, it is a cost-effective option.